If you had to hazard a guess as to how many statues there were to women in the city of Glasgow, a city with a centuries-long history, a city co-founded by a woman St. Thenew, a city of some 2.3m people, what would it be? 100? 50? 10? In fact the answer is just three. 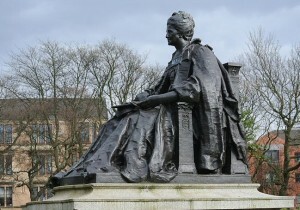 One doesn’t really count, as it is Queen Victoria and which town or city doesn’t have a statue to her? The second is ‘La Pasionaria’ a stylised female figure, representing Dolores Ibarruri a Spanish communist who came to symbolise Republican resistance against fascism during the Spanish Civil War. The third statue, and the only one to commemorate a Glaswegian, is of Isabella Elder. 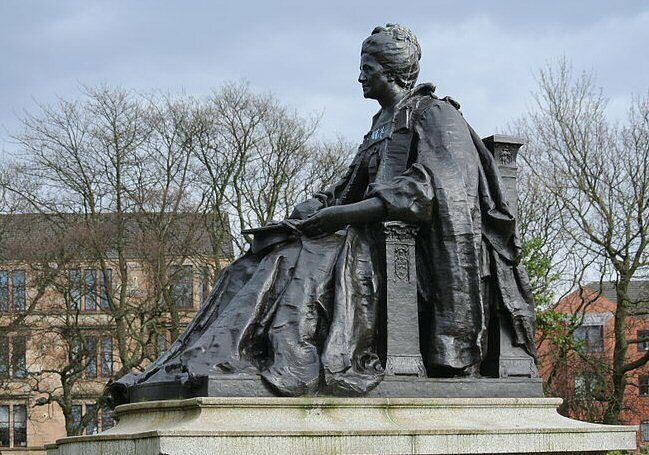 Isabella Elder was a wealthy philanthropist living in Glasgow in the mid 1800’s who took a particular interest in promoting opportunities for women in higher education. Isabella was born the daughter of a solicitor and later married John Elder a partner in a thriving marine engineering company which also acquired a shipyard at Govan. By the time John Elder died it was regarded as one of the world’s leading shipbuilders. On John’s death Isabella became sole owner of the business and ran it successfully for nine months until she arranged for the day to day running to be transferred to her brother. Now a wealthy widow with no children, she had time on her hands and began touring the continent and seeking out philanthropic projects in her home city. In 1883 Isabella bought land near the Fairfield Shipyard, and had it made over as a public park. She named it the Elder Park in memory of her husband and her father-in-law. For many years after the park opened she paid for an annual fireworks display to be held there. She also set up a “School of Domestic Economy” in Govan which set out to teach young women how to prepare nutritious meals and other tasks which young women needed in order to manage a household on a very small budget. Isabella also took a keen interest in higher education, and particularly Glasgow University which was close to where she lived. In recognition of her late husband’s support of scientific principles in industry she gave an endowment of £5,000 to support the chair of Engineering and a further £12,500 to endow the Elder Chair of Naval Architecture. But it is her support of education for women that merits even greater recognition. When Queen Margaret College (QMC), the first college in Scotland to offer higher education to women, was founded she purchased North Park House in Glasgow’s West End and gave it to the College rent free. Although taught by university staff, women could not at that time qualify for a degree. When it was finally decided that women would be accepted in universities, QMC became part of the University of Glasgow. However Isabella remained concerned that if women were taught separately they would receive sub-standard teaching, and only agreed to North Park House being handed over to the University on condition that the teaching provided to women was equal to that of men. On her death it was fitting that the certificate was signed by Dr Marion Gilchrist, the first woman to graduate in medicine in Glasgow. In her will Isabella left more than £125000 to be used for charitable purposes including the Ure Elder Fund for Indigent Widows of Govan and Glasgow. The statue to Isabella stands in Elder Park surrounded by a memorial garden. The cost, some £2000, was raised by public subscription, much of it from the ordinary people of Govan who she had supported through her philanthropic works. Isabella Elder was nominated by Anabel Marsh (@anabelmarsh), who also made the photograph available via WikiCommons. Thank you! One of my heroines, and my chosen character for #MarchOfWomen. The City Council publishes an interesting booklet with a trail round Elder Park – it’s worth a visit. Thanks Anabel. I’ll be Mary Barbour in #marchofwomen! And I’ll be sending you a thank you and acknowledgement for the photograph – as soon as I get it uploaded.